Rome attraction-guides.com - Rome, Italy attractions guide Rome St Peter's Basilica Church (San Pietro Montorio) information about attractions, architecture, landmarks, history, works of art, marble sculptures, Michelangelo's Pietˆ, Bernini, location and address, tel / telephone number, general tourist information about St Peter's Basilica (San Pietro in Montorio) in Rome (Roma) area, Italy (Italia) IT - Last updated 30/10/2012. First opened in 326 AD, this great temple stands over the tomb of St. Peter, who was the founder of the Church of Rome. It was torn down during the Renaissance, to make way for a grand basilica which took around 150 years to construct. St. Peter's Basilica Church (San Pietro in Montorio) has long been one of Rome's most impressive landmarks and attractions at the church include many original features and striking architecture. 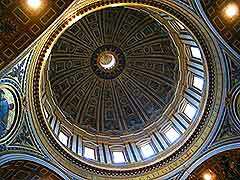 The dome, which dominates the St. Peter's Basilica Church, was actually designed by Michelangelo and you are able to reach the top by using an elevator and stairs, where you will find magnificent panoramic views of the Rome, from over 100 metres / 328 feet high. Rome's St. Peter's Basilica Church (San Pietro in Montorio) houses a number of famous works, such as the canopy over the high altar, a majestic creation by Bernini, the gilt bronze Chair of St. Peter, the monument to Clement XIII by Canova, and Michelangelo's famous 'Pietà', a wonderful marble sculpture. St. Peter's Basilica Church (San Pietro in Montorio) 187 metres / 613 feet long and 132 metres / 432 feet high and is the heart of Christianity in Rome and the whole of Italy. The vast interior of St. Peter's Basilica Church can hold a staggering 60,000 people for services and blessings.